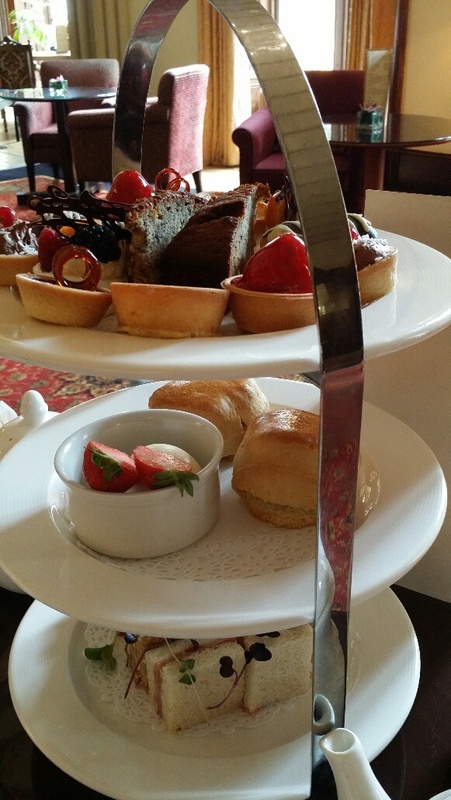 ( Afternoon Tea was the order of the day and what better place to have it than the stunning baronial mansion that is Mar Hall . This stunning building dates back to the early 18th century and was recently renovated at a cost of around 15 million. The building was formerly Erskine Hospital but does not give a hint of this nowadays . The ground has a golf course and spa and it is classed as a 5 star wedding venue . On this count i can not argue. The long winding and immaculately kept driveway hides a stunning loch view until you turn a sharp left at the end and there is the reason this place holds a dear place in my heart . A view to die for and A couple of bronze stags welcome you to the grand halls . Inside the main Hall is the reception where you are courtesly greeted on arrival and shown into one of the most beautiful drawing rooms i have seen. Lovely tapestries on the wall and mostly all original features still remain here. Love the large wooden doors of all different sizes leading into different corridors and allowing a peek view of the stunning view outside and all around the grounds. Anyhow i was here for the Afternoon Tea priced at £22-50 each ( The cake stand pictured was for 2 people at a cost of £45 June 2016) . Now on my travels in the last 20 years this would not be considered cheap or even moderate so i was anticipating great things. We were seated at a table for two which was a great deal higher than the chairs making eating and viewing what was actually on your table a bit of a problem. In fact both myself and my guest had to stand up every time we wanted to see or move something on the table . This will be over looked i told myself when the Afternoon Tea comes. We were politely told our Afternoon Tea would not be long and neither it was . Out arrived one stand with 6 tiny sandwiches ( No garnish , dressing, or savouries) A middle plate with two rock hard scones and a tablespoon of clotted cream . The 1 strawberry which garnished the clotted cream sadly tasted of onion . The top tier was full of tiny little pastries which looked great but i would question whether they were all Baked on the premises . Sadly my experience was tarnished by the offering of the two tiny egg mayonaise sandwiches ( 1 for me and 1 for my guest ) They tasted of vinegar and quite obviously had turned in the heat of the kitchen or just not fresh . A second batch was brought to the table which were perfect and tasted of egg mayonaise but by this time i was feeling a bit queezy at the thought of what i had just eaten. There was no atmosphere in the large beautifully decorated halls where we sat and this is a shame . Overall i would say my experience here is not how i remember it from years gone by but for a wedding venue or overnight stay it would be hard to beat .